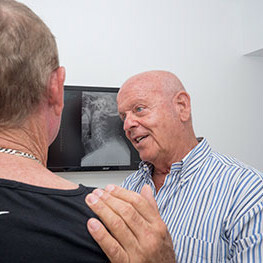 Dr Richard Singer (Chiropractor) and his wife Debbie, the practice manager, offer a warm, inviting environment that all ages feel at home in. If you’ve brought your paperwork in already filled out, you’ll meet Richard immediately to get started on a consultation. The forms for new patients can be downloaded from our website and brought in completed. Need a new patient form? Download it now. We’ll discuss your history, then do a computerised spinal range of motion study. One of just a few in our area, it uses strategic points of your body, going through a series of movements to test areas of potential weakness. We’ll also do a functional examination of your spine and nervous system. X-rays may be recommended, which are bulk-billed to Medicare. Richard has a diploma in spinal radiology from the U.S. and will study these images to discuss with you when you arrive for your next visit. You’ll receive a chiropractic adjustment to start pain relief immediately. If you want to stay healthy, you’ll make a commitment to eat healthy, exercise, get proper sleep, have a positive mental attitude and see your Chiropractor to maintain overall health and wellbeing. Spinal adjustments may help you maintain the health of your nervous system. It’s easier than waiting for your body to break down and then trying to restore your health and wellbeing. Once your health is stabilised, we’ll see you less often. Regular reassessment on our computerised spinal analyser allows us to measure your progress, with appointments dropping down in frequency as your health improves. Do You Have Questions About Your Chiropractic Care? We’ll always try to reduce your pain first. 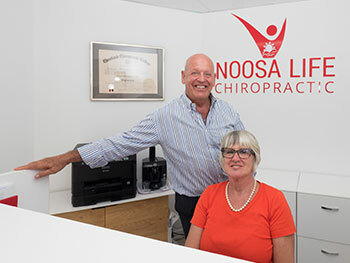 Dr Richard and his wife Debbie welcome all residents and visitors to Noosa.